New to the scene of organic baby clothing, we recently discovered Fellini Baby, a line of super comfy, high quality baby clothing. 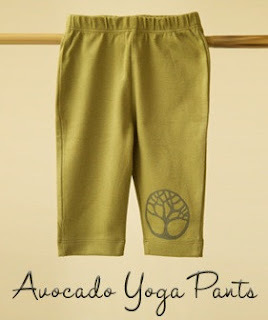 We were sent the Avocado Yoga Outfit ($42.50) that Baby T is checking out above, Baby E insisted that the pants go on his head, of course he was amused. :) He is 8 months old, but a pretty big baby, so I got the 12-18 month size outfit. As you can see it fits him great and there is some room for him to grow into. If you are interested in Fellini Baby clothing I would say it is true to size, but on the safe side I would size up since I'm not sure if it could shrink a little after washing like most clothing does. "Wish it came in my size!" "I think he'll be wearing this 24/7..."
These are beautifully designed and made garments. I love the contrasting cuffs and the tree motif. Everything from the top quality fabric to the nickel free snaps is perfectly thought-out. 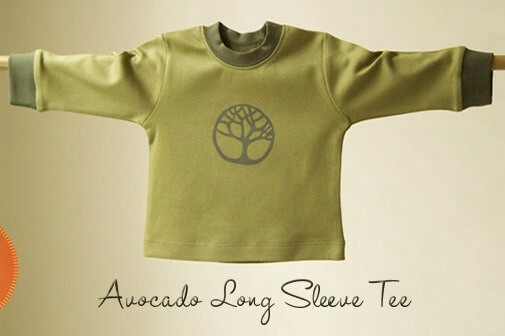 It is made from 100% organically grown cotton certified by SKAL. The cotton is sourced with Oxfam fair trade suppliers who pay workers good wages and use no child labor. The snaps on the shirt make it easy to put on and take off. 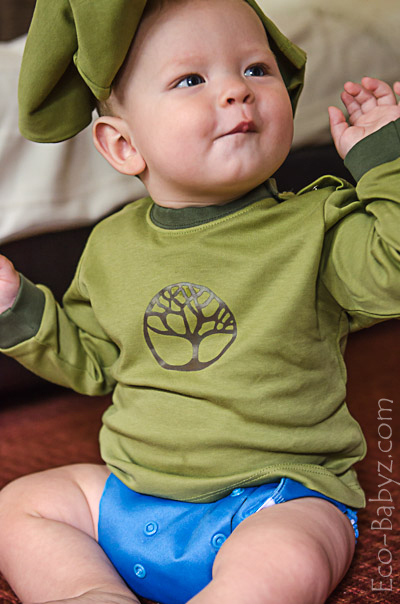 The pants have a gentle elastic and are cloth diaper friendly, comfortable for every day. There are so many places I can think of Baby T wearing this outfit. It's nice enough to wear out and about, but soft enough to sleep in. I have a feeling this will be a favorite for fall, it just looks so comfortable, I would feel extra guilty stuffing him into a stiff pair of baby jeans! The outfit can also be separated for even more possibilities and worn with whatever else you have in your baby's wardrobe. Fellini Baby is a brand to lookout for, with all the right ingredients for success. We would love to see what else they will dream up in the future! Meanwhile their organic yoga outfits, onesie, baby sack, and blanket are a great start to the high quality collection. I'm definitely a fan of these gender neutral and socially responsible baby clothing pieces and Fellini Baby gets an A+ in my book! 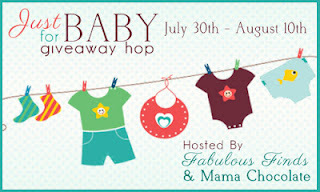 Don't forget to come back Monday, July 30th to enter the giveaway to win a Yoga Outfit for your little one! Oh my, it looks so soft, I just want to snuggle up with the outfit! I'd love to get one for my daughter! I am absolutely in love with this clothing line, and can't believe I hadn't heard of them before now. 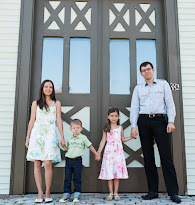 One of my favorite finds from reading this blog! Adorable! I love the look of their clothing! What type of camera do you use? Your pictures are beautiful! Thank you Ashley! I use a Nikon D7000 with 24-70mm f/2.8G ED AF-S Nikkor Wide Angle Zoom Lens. Still learning to use it though :) It's a learning curve for me. I love the color and that it is organic! I think my son needs son a yoga outfit to wear while I do yoga and he "does yoga with mommy"! Oh my goodness, can they please stretch those outfits out so I can wear them too? Those pants could not look more comfortable. Certainly a comfy baby would be a happy baby, right?? I've never heard of this company before but I have to say their clothes look really good. I'd love to touch and feel them. I agree with you, they should come in adult size too! How cute! Those look really comfortable. These look soooooo comfy! Would be perfect for all-natural sleepwear! I like simple print and colors, I'm sure it is so comfortable. All I can say is, I love wearing my yoga clothes, why wouldn't one of my children?! They look very very comfortable! They look so soft and snuggly! Looks so soft and comfortable. Perfect for wearing around the house. This is my favorite product there! Love the green! These clothes are so very cute! I love the stylized tree on the top. I also really appreciate how soft these clothes are. Thanks for the review! Those shirts look so soft! So cute! Your little guy is going to look adorable in that, I'm sure. I am off to look and see what else they have!